Josh is here for awhile today. We have to do more analysis to determine if water or acid should be added to the rest of the fermenting wine. Along with Cabernet clone 6, we still have Montepulciano, Mourvedre, Carignan, Petit Verdot and an Escuro blend of Tannat, Alvarelhao and Souzao perking away. Over the last several days we have adjusted many of these and still have to look at the Escuro blend and Mourvedre. Also the acid on the Petit Verdot is a little low so we have to look at the numbers on everything this morning. We also have to discuss the possibility of pressing some tomorrow. We have been harvesting 2nd crop for the last two days.......We harvested another .75 tons today, 1.5 so far this week for Dave's Cuvee. [Brad here. 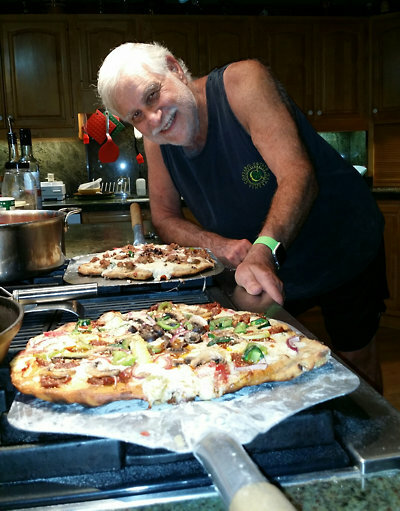 One of Dave's customers took this picture of Dave and his pizza in Dave's kitchen. Pizza kitchen? I know that kitchen. A couple of times a year I'm lucky enough to go up there and Dave and I make our own pizzas. Drink wine and have a good time. We both thought that maybe the last time we did it was maybe the best set of pizza's we'd done. Lots of practice. Lots of experimenting. My pizzas use a different type of flour, though my favorite thin pizza flour is something I just found out about. Dave bought some II Caputo 00 Red Pizza Flour and let me try it out. I went out and bought a case of it. Pat and I still have plenty to do in the next few weeks before we head off to our cruise. We are going through all our club member credit cards and we have 10% with expired cards so we just sent out an email asking for updates. Next Friday we will send out an email to all club members announcing the dates of the shipment and also asking for credit card updates so I will be busy copying the updates in to our secure file. Even after all these email requests, we usually get another 10% of bounces after running the cards. We harvested 3.27 tons of second crop which should produce about 200 cases of 2015 Dave's Cuvee. The sugars were very high, some as much as 29%. We added some water for now and in a day or so we need to see what the potential alcohol will be.